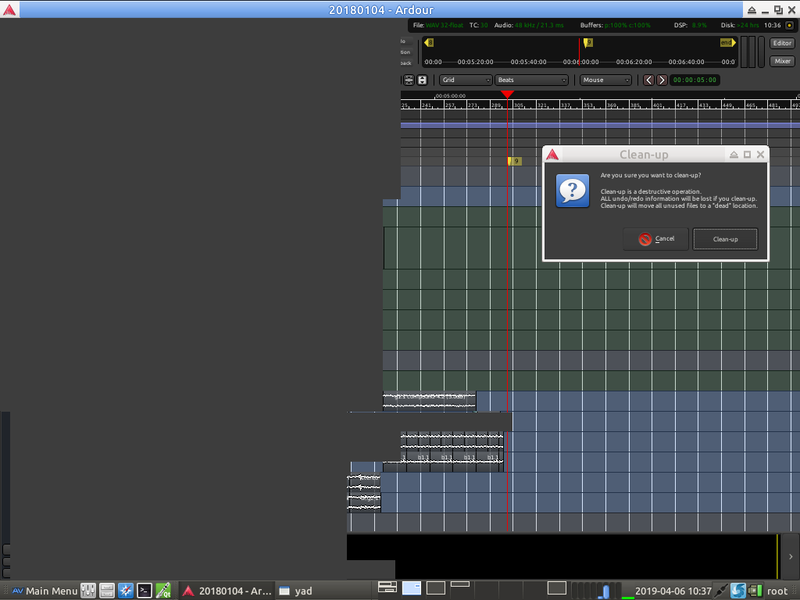 This is a problem in ardour 5.12.0. 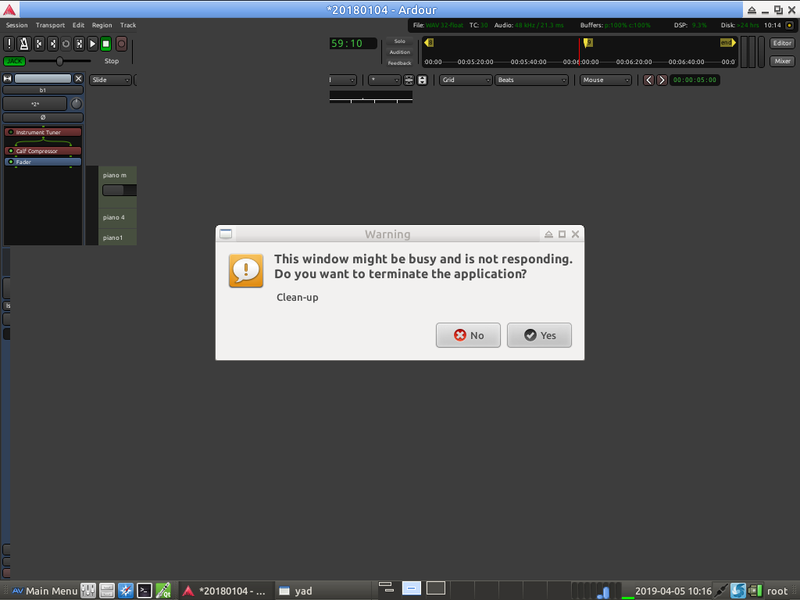 In some sessions when I try to clean-up unused sources the machine seems to go into a loop with the different CPU cores becoming hyperactive and then ardour hangs and has to be killed with a ‘killall’. I’m sorry I have no idea how to debug this. Could you send a video of what happens, and when the error log appears? That way I could try to help - I’m not expert or dev by any means but I can try. Sorry, unless I’m missing something, it seems that attachments in this forum are limited to image files. I cannot upload a video so for what it’s worth I’ve attached screenshot images. 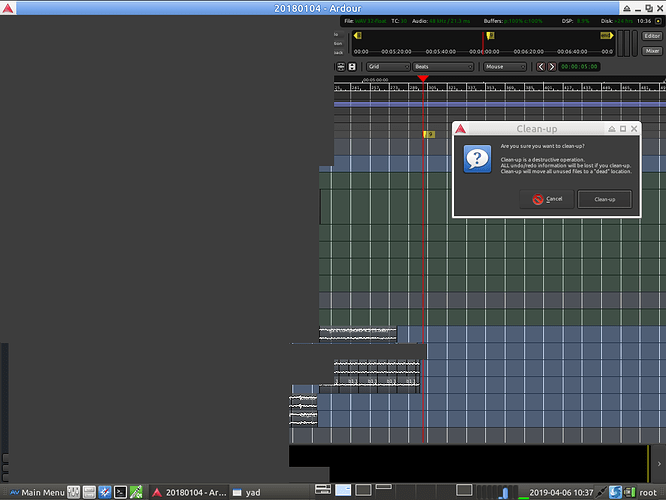 As for error logs, I don’t know where ardour logs its errors. I’ve included a bash “top” which shows that Ardour is running at 118% !!! only to clean-up unused files. As can be seen from the screenshots, whatever the problem is, it seems to be quite low-level because it is impacting the graphics. 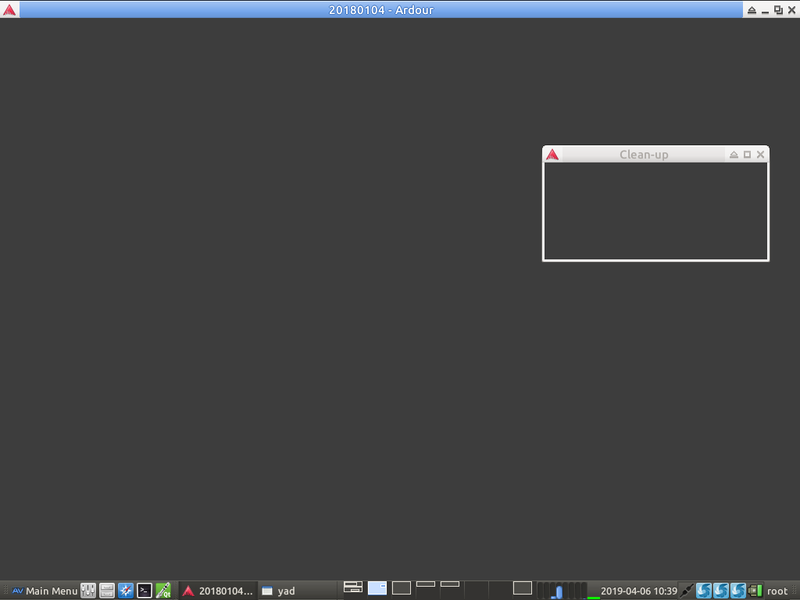 By switching to another workspace or using the desktop menu, parts or all of the ardour display is blotted out. At this point the only thing left to do is killall ardour. It seems that you’re using snapshots. In that case Ardour checks all snapshots if the source-file is used in any of them. So likely there’s a bug hiding there (which is why others don’t experience this). Could you start Ardour from the terminal? When initiating cleanup, there should be some additional information on scanning snapshots printed there. That might provide a clue. As I was saying, it did finally clean up so what I described as a hang was maybe more like a very,very long clean up with the addition of the inability to cancel the operation. 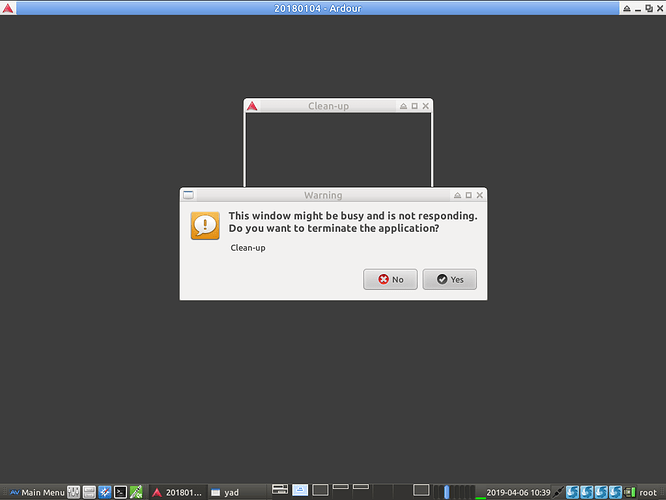 I only had one session that exhibited his problem and now that it is fixed I can’t reproduce it. Thanks for the help.